What is Mycobacterium Avium subspecies Paratuberculosis (MAP)? Mycobacterium avium subspecies paratuberculosis (MAP) belongs to a family of bacteria called ‘Mycobacteria’, which also includes Tuberculosis and Leprosy. How does MAP cause Crohn’s Disease? MAP is the well-established cause of Johne’s disease – a form of Inflammatory Bowel Disease very like Crohn’s Disease (CD) which affects animals, including domestic livestock. Data from the US suggest 91% of dairy herds are infected1 (although most will not show outward signs of disease). Milk from infected animals often contains MAP and not all of it is killed by pasteurisation because MAP is a very tough bug. In 1996, Millar et al tested pasteurised milk ‘off the shop-shelf’ for the presence of MAP over an 18-month period. Overall 7% of 312 milk bottles contained live MAP – but during peak times between Jan-March and Sept-Nov, up to 25% of milk bottles tested positive2. MAP is also present in the faeces of infected animals; rainwater falling on agricultural pastures washes this into nearby rivers –MAP has been detected in such waters and can even be found in tiny droplets of water in the air that aerosol off these rivers. Epidemiological studies of CD often show unusually high numbers of cases of the disease in areas clustered around rivers which drain agricultural farmland3. MAP is very difficult to detect in people because you can’t see it under an ordinary microscope and it is very difficult to grow. With standard modern methods using a test called PCR to detect MAP by the presence of its DNA, most people with CD are found to be infected: In 2003, Bull et al detected MAP in the gut of 92% of patients with CD and 26% of controls (P=0.0002)4. It is unsurprising to find MAP at a background level in controls given the widespread exposure. Using the new diagnostic test for MAP which Prof Hermon-Taylor and his team are currently developing, MAP can actually be SEEN in the blood and tissues of people with CD for the first time ever and has so far been detected in 100% of CD patients tested (unpublished data). Surely if Crohn’s was caused by an infection, more people would have it? Not so. Just as it was 100 years ago when people were widely exposed to Tuberculosis (a distant cousin of MAP), not everyone who came into contact with the bug got sick. What determines who gets Crohn’s and who doesn’t? The form of MAP to which the person is exposed: MAP exists in (and switches between) 2 forms; an ‘encapsulated’ extracellular form, to which humans are not particularly susceptible, and a ‘naked’ intracellular form which is just as tough and more virulent (see FAQ No.11 for more details). The dose of MAP to which the person is exposed and the frequency of exposure: Exposure to high levels of MAP may sometimes be more likely to result in disease. However, the concept of a “minimal infective dose” at any one time (which may apply to bacteria causing an acute disease such as dysentery) is less likely to be applicable to a slow-growing bug like MAP, causing chronic disease. With MAP, a significant number of bugs may build up slowly over time in someone who is susceptible, due to prolonged intermittent exposure to low numbers of MAP in milk and water supplies. The susceptibility (both genetic and acquired) of the person concerned: Susceptibility can be due to genetic factors (certain genes are known to be associated with a higher risk of CD) or acquired… life events such as an episode of major physical illness, pregnancy or periods of severe stress can trigger CD. This is probably due to alterations in the way the immune system handles MAP that is already resident in someone. What is the difference between those who get Crohn’s and those who do not? It actually comes down to a form of Immune Deficiency; our bodies have several levels of defences against invading bugs. The most basic defence cell is called a ‘macrophage’ -it is a type of white blood cell which behaves a bit like ‘pac-man’! It patrols the body eating up and digesting any invaders. Then there are the more sophisticated ‘T-cells’ – another type of white blood cell, specifically designed to defend us against bugs which hide INSIDE cells in the body –like MAP does. When healthy people are exposed to MAP, their macrophages gobble up and digest MAP and their T-cells ‘see’ and eradicate any MAP-containing cells. They may retain a few isolated bugs but they never get sick. When someone susceptible is exposed to MAP, it is a different story. Their macrophages eat MAP but cannot digest it and MAP remains, happily living inside the macrophage. In addition, their T-cells are ‘blind’ to MAP; they cannot eradicate it and MAP is allowed to multiply unchecked, generating vast numbers of organisms inside the gut as well as other tissues (even inside the T-cells themselves). This is the person who develops Crohn’s Disease. How does MAP actually cause disease? MAP itself does not directly cause gross inflammation by taking on the immune system head-to-head. In fact, MAP minimises its own immune recognition. Instead it initiates a cascade of events with disastrous consequences. The first is to cause dysregulation of the immune system which then destabilises the gut wall, rendering it leaky. Leakiness of the gut wall allows it to be penetrated by other gut organisms (e.g. bacteria such as E.coli, yeasts and viruses) and irritant food residues. It is these secondary invaders and irritants that cause the massive inflammatory response which creates the Crohn’s pathology. The second is to damage and inflame the delicate nervous system in the gut wall which makes the consequences of the immune dysregulation a lot worse. Immunosuppressants can reduce Crohn’s symptoms by lessening the inflammatory reaction in the gut wall (some may also possess some direct anti-MAP activity). Antibiotics like metronidazole can reduce Crohn’s symptoms by killing off other bacteria which invade the gut wall. Bland diets can reduce Crohn’s symptoms by removing some of the irritants which trigger more inflammation, but unless you treat MAP itself, you are only treating the mechanism and not the cause of Crohn’s Disease. That is why we need this therapeutic and preventative modern Vaccine. We are often asked by patients for details of AMAT. This double antibiotic therapy, pioneered by Professor Hermon-Taylor in the 1980s ( see paper here ) was later enhanced with a third antibiotic by Professor Borody in Sydney, Australia and went on to form the basis of the single pill currently on trial through Redhill. For those wishing to learn more about AMAT, or to share it with their doctors, the patient information leaflet can be downloaded here: AMAT Patient info leaflet. Chronic regional intestinal inflammatory disease: A trans-species slow infection? 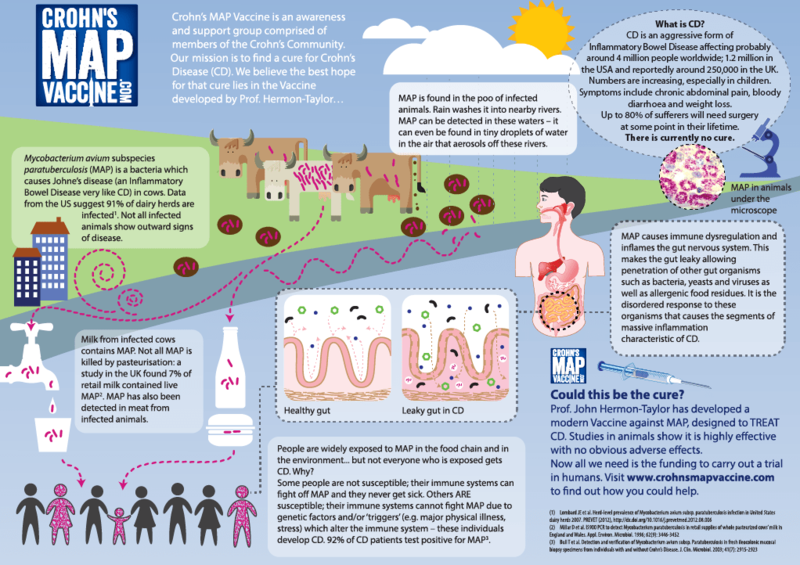 *By submitting your details, you agree to Crohns MAP Vaccine sending you occasional email updates/news. We respect your privacy and will never send SPAM or distribute your details to any third parties, other than those directly appointed to act on our behalf. You can unsubscribe at any time. © 2016 PROFESSOR JOHN HERMON-TAYLOR. ALL RIGHTS RESERVED.